June 17, 2013: My building has every convenience. It's gonna make life easy for me. and The Wire come in close. All great shows. I'm talking about shows that set the new standard. The Prisoner was the summer replacement for the Jackie Gleason show. That couldn't happen today. This song playing is a wired version of I Feel Love. I wonder how many pirate-themed beverages young amEdeo has consumed today. The Avengers was my favourite! I apologize; too many "MK" Avatars in a row! I could have said in one comment, were I able to string a sentence together..! Zero. I am a sober adult who does not drink pirate themed drinks. I refute all pirate drink slander. Absolute baseless hogwash! If you drink enough pirate beverage, you yodel along with Hocus Pocus on mic. The interwebs says that Belaboris took there name from Lugosi's and Karloff's first names. Therefore I'm guessing it's BEL-uh-BORE-is. I read that Debbie Googe (MBV Bass player) replaced Mani (Stone Roses) Primal Scream. ..replaced Mani in Primal', not 'Roses. Yes, Debbie replaced Mani in Primal Scream. I escaped the tinnitus, fortunately. I didnt hang around for the sound inferno! I'm seeing MBV four times in ten days in August. My ears are not happy with my decision. when I heard Kirsty, I ran over to drum set and bashed away. Love to play drums to "they don't know". Beautiful song! I might be at that show. I haven't seen The Muffs in close to 20 years, and I've never been to Maxwell's. Won't be able to do the latter much longer. Forgot about Kirsty doing that one. Is maxwells a basement venue? It's always sad to lose a club you love. They should let 'em be! 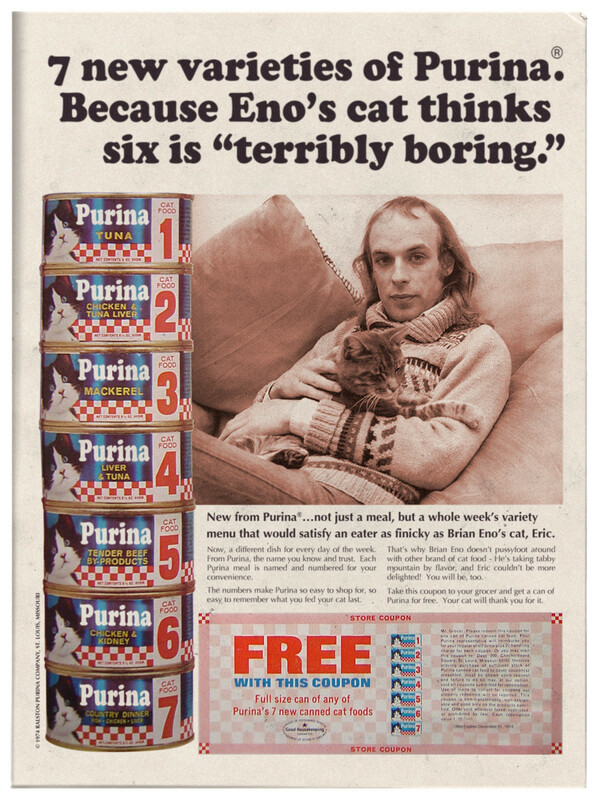 Brian Eno appears in a magazine ad for Purina cat food. Enossification free with every purchase. Hmm...anyone else thinking that if J. Mascis was in Yo La Tengo it would sound like Technicolor Teeth? Marmalade Kitty. It's odd. There's a nice restaurant/bar and you wouldn't know it's a venue. The bands play in a sort of back room that is sort of small and very spare, no tables, chairs. I was only there once, to see the Feelies and it was fantastic. Something abou that room brings it all together. You feel a part of it. Maybe because the Feelies are special to the place but it was apparent from start. Yeah...I'm ordering that Technicolor Teeth LP! Have to chime in here to point out that the Brian Eno catfood ad linked above is a parody created by Cris Shapan, not a real ad. Oh, you already said that, BadGuyZero! Never mind.